Water Hero notifies you over text or e-mail to alert you to potential leaks — if water is running for more than a user-set amount of time, we send you a text or e-mail and shut-off your water. Toggle between home and away mode based on your availability for the highest degree of protection. Water Hero monitors the ambient temperature at the installation and sends you an alert if you have gone outside of your determined range. This can indicate potential for a fire, furnace failure, door blown open or future burst pipe. Water Hero has a rechargeable back-up battery, enabling continuous operation when power goes out. During this time, Water Hero will shut your valve and sends alerts if you exceed thresholds and will continue to store water consumption data. 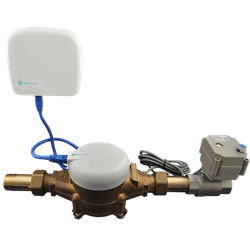 Water Hero monitors the ambient temperature at the installation and sends you an alert if you have gone outside of your determined range.